Not every argument is offered with the same intention. Sometimes arguments are offered to prove that something is definitely the case; other times they are offered to show that something is likely or very likely to be true, while leaving it possible that the conclusion may, improbably, turn out to be false. Before you can tell whether the premises of an argument provide appropriate support for the conclusion, you need to decide which standards to use in your evaluation, and this depends on whether you have an argument of the first or the second kind. The topic for this segment is the distinction between the two, and we will express it as a difference between deductive and non-deductive arguments. Remember that arguments are groups of statements some of which, the premises, are offered in support of others, the conclusions. There are two kinds of support that premises can give for a conclusion: deductive and non-deductive. When the premises of an argument support the conclusion deductively, we say that the conclusion follows deductively from the premises. Deductive support is the strongest kind of support that premises can give to a conclusion. When the premises of an argument support the conclusion to some significant degree, but do not support it deductively, we say that they support it non-deductively. In this case, the argument is non-deductive. If you want, you can think of successful deductive arguments as providing conclusive support for their conclusions, assuming the truth of their premises, whereas successful non-deductive arguments give probable, but not conclusive, support for their conclusions. Let’s start with deductive arguments. Definition: A deductive argument is an argument for which the premises are offered to provide logically conclusive support for its conclusion. There are phrases people may use in arguments to indicate that they are deductive. Every witch is a widow. So it necessarily follows that every witch is female. It’s good to read the Bible on as many days of your life as possible. Therefore, any day is a good day to start reading the Bible every day. The number of chicks in the pen is less than 10. The number of chicks in the pen is more than 6. It’s not 7 and it is not 9. The number of chicks in the pen is an integer, because you can’t really have half a chick in the pen. Certainly, then, the number of chicks in the pen is 8. 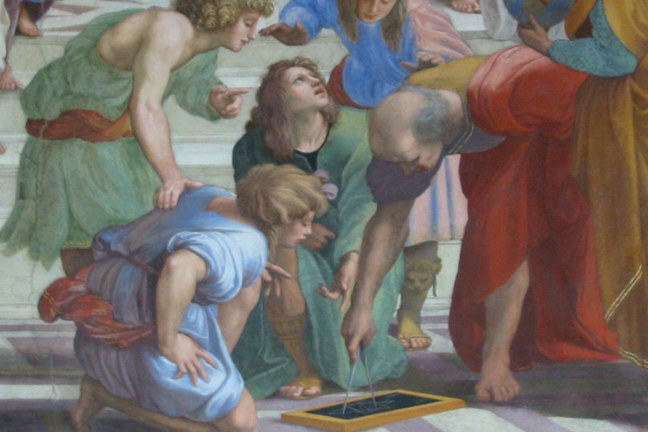 The way Euclid proved the Pythagorean theorem was a very good instance of deductive reasoning. Euclid argued in such a way that if all his postulates were true, then the Pythagorean theorem must also be true, with no room for doubt. If you change the postulates then the Pythagorean theorem may no longer be true. But that doesn’t change the fact that Euclid’s argument from his five postulates—as premises— to the Pythagorean Theorem offers conclusive support for its conclusion. Euclid was applying deductive reasoning to geometry. Many philosophers and scientists over the centuries have tried to mimic Euclid’s style of reasoning by providing deductive arguments for their views. However, such standards for arguments cannot always be met successfully. And that’s where non-deductive arguments come into play. Definition: A non-deductive argument is an argument for which the premises are offered to provide probable – but not conclusive – support for its conclusions. In a good non-deductive argument, if the premises are all true, you would rightly expect the conclusion to be true also, though you would accept that it may be false. If you like, think of non-deductive arguments in terms of bets. If the premises of a good non-deductive argument are true, then you would be happy to bet that the conclusion is also true. The argument would have provided you with the confidence that your bet is a sensible one, but – since it is a bet, after all – you would accept that the conclusion may turn out false and you may lose. As with deductive arguments, there are phrases people may use to indicate that arguments are non-deductive. Here are some examples of non-deductive arguments. It’s cloudy today, so there’s a high probability that it will rain today. The greediest person who was left alone in the room is Aunt Mary. Chances are that Aunt Mary is the one who stole the apple tart. Every observed witch is a widow, so it’s likely that every witch is a widow. Only all the observed wizards that we’ve seen so far were widowers. So the next one we expect to be a widower.